Just want to apologize for my English. I am from Belarus andif there are errors, then feel free to write about them, I will correct them :). Today I suggest you to install a wonderful program product. This is a graphic simulator of network equipment GNS3, which allows you to simulate complex network solutions on a local computer. This program uses real IOS of routers and L3-switches cisco, can emulate Linux-hosts, have support PIX/ASA, IPS and many other interesting things. GNS3 - a great help in preparing for exams cisco (CCNA, CCNP, etc. ), and just a good way to maintain you network knowledge to be good :), by creating different lessons and simulations of different situations on the network. In the beginning, download the latest version of GNS3 from that place http://www.gns3.net/download. About IOS-s to routers and firewalls suggest you go to google, I think it will help :). Another way - is to buy everything you need on Amazon.com by clicking the link side of the page. 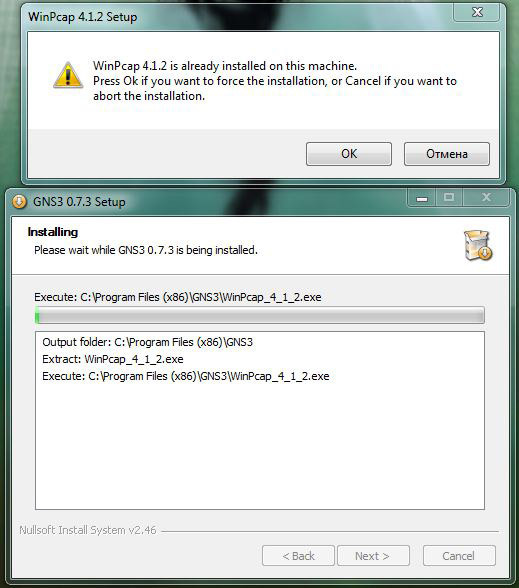 Running file GNS3-0.7.3-win32-all-in-one.exe (It was the latest version at the time of download). WinPCap (Windows Packet Capture) – a program, that catches, count and transmit the network packets. Dynamips – is an emulator program. Dynamips runs on Linux , Mac OS or Windows and can emulate the hardware of the Cisco series routing platforms by directly booting an actual Cisco IOS software image into the emulator. QEMU - is an open source, fully emulates the PC. In addition to emulating a processor, QEMU can emulate all necessary subsystems, such as network adapters, and video adapters. It can also emulate the more advanced things, such as symmetric multiprocessing systems (up to 255 processors) and other processor architectures such as ARM or PowerPC. On this screen I recommend to select all the components (by default). Click «Next», choose a folder to contain the program and click «Install». 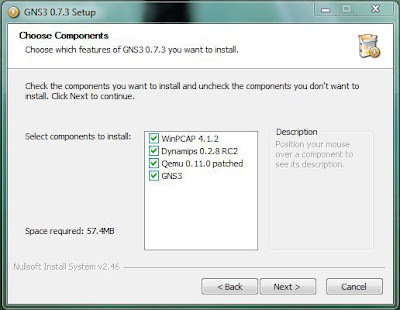 If you have already installed WinPCap and you have not removed a tick in the choice of components, the following window will appear. Click «OK», setup will prompt you to install WinPCap again (install, if your version is older than the package with GNS3). During installation WinPCap, all the time press «Next» (or «Install») without changing the default settings. Push the «Finish» button and… Congratulations!!!!! 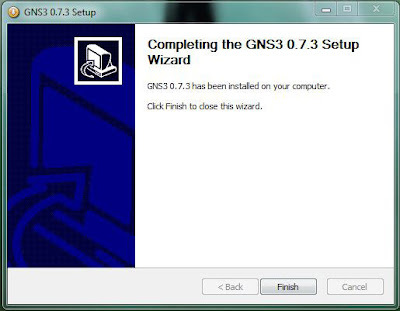 You have just installed GNS3 on your PC :).